New AFOs - Handmade, hard plastic AFOs that CCS made for Gwendolyn. Over time we will be able to adjust these to accommodate Gwendolyn's flexibility improvements. 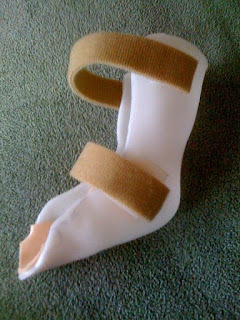 These will also do a better job of holding her ankle in place. Kinesio tape - This is pretty interesting stuff. 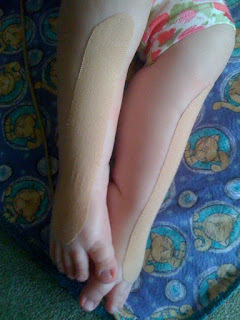 Kinesio tape uses elasticity to fight Gwendolyn's tendency, a result of her SMA, to constantly over-contract or extend her feet all the way to a pointed position. The tape works against that tendency and, over time, the theory is that Gwendolyn will become tired of fighting the tape and her feet will rest in a more normal position.